This lot is a skein of Divine yarn from Patons. It is a bulky weight yarn. The skein is 3.5 oz and the color is Chantilly Rose, lot # 241006. It is 79.5% acrylic/18% mohair/2.5% polyester. 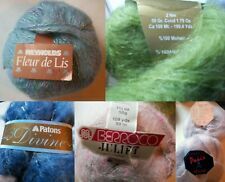 Patons DIVINE "Deep Earth" #06013 Acrylic/Wool/Mohair/Polyester Yarn-142 Yds. Content: 76.5% Acrylic - 10.5% Wool - 10.5% Mohair - 2.5% Polyester. Soft, light knitted and crocheted fabric. Haloed mohair look is right on trend. Length: 142 yd / 129 m. Hand wash.
5 out of 5 stars - Patons DIVINE "Deep Earth" #06013 Acrylic/Wool/Mohair/Polyester Yarn-142 Yds. 1 product rating1 product ratings - Patons DIVINE "Deep Earth" #06013 Acrylic/Wool/Mohair/Polyester Yarn-142 Yds. Content: 70% Mohair, 25% Wool, 5% Nylon. Bulky weight. 6 SKEINS PATTONS LACETTE MOHAIR BLEND YARN. 1.75 oz ~ 50 g 235 Yards ~ 215 m Per Skein. 39% Nylon 36% Acrylic 25% Mohair ~ Machine Wash Cool Water Delicate Cycle ~ Flat Dry. COLOR: #30128 BEAUTIFUL BLUE. Patons Yarn. "Hint of Rose ". 1.75 Ounces - 235 Yards. Size D Hook. Patons Nuance mohair blend yarn is soft and lofty-- perfect for winter accessories such as scarves, hats, and shawls, as well as sweaters and afghans. Discontinued and hard to find! - 6 skeins included in lot 1 mystery skein! 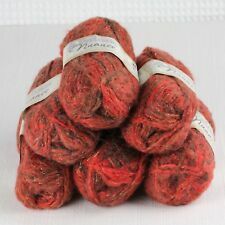 Patons Nuance Variegated Mohair Blend Yarn -- Highlands -- 6 Skeins + Free Gift! 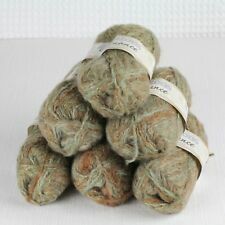 Patons Nuance Mohair Blend Variegated Yarn -- Marble -- 6 Skeins + Free Gift! Each skein weighs 50 grams. The blend is 56% Acrylic, 24% Wool, 20% Mohair. All new and just out of storage. Linate Classic 100% mohair. 50 grams Made in Turkey. Color is apple green. Berroco Juliet 72% mohair 18% acylic and 10% polyester. 50 grams Made in England. Color is gray (maybe) with pink, black and turquoise flecks. Angelica by Patons. 85% Acrylic/15% Kid Mohair. The weight of each is 50 grams which is about 1.75 oz. The yarn is hand washable, dry flat. I have owned this yarn about 18 years. I have more. Ten 50 gram (1 3/4 oz.). Wrap up in this beautiful soft yarn. International may take longer.